Air Vice Marshal TD Joseph (Joe), our course-mate from the National Defence Academy (NDA) and Sophie Joseph visited us during the last week of May 2016. Joe and I hail from the same village -Ayarkkunnam – in Kerala, India. Joe was surprised to be invited to many homes of people who had migrated to Canada from the very same village. Prior to leaving India, everyone wanted to know as to why he was only visiting Canada and not the US. Most sub-continental travellers presume that Canada has nothing much to offer and a journey to the North American continent essentially was limited to a handful of US destinations. Joe was however convinced after reading many of my travelogues on my blog that Canada has many fascinating unexplored areas, unknown to even many who have settled here for decades. The weather was good, adequately warm to undertake long journeys and for trekking. We travelled well and made use of every minute at our disposal. The itinerary included Mennonites of St Jacobs, Niagara Gorge, Niagara Falls, Welland Canal, Wine Country, Flower Pot Island, and CN Tower. (Please click on each one to read about them on my earlier Blog Posts). We also visited the African Lion Safari and Casa Loma. 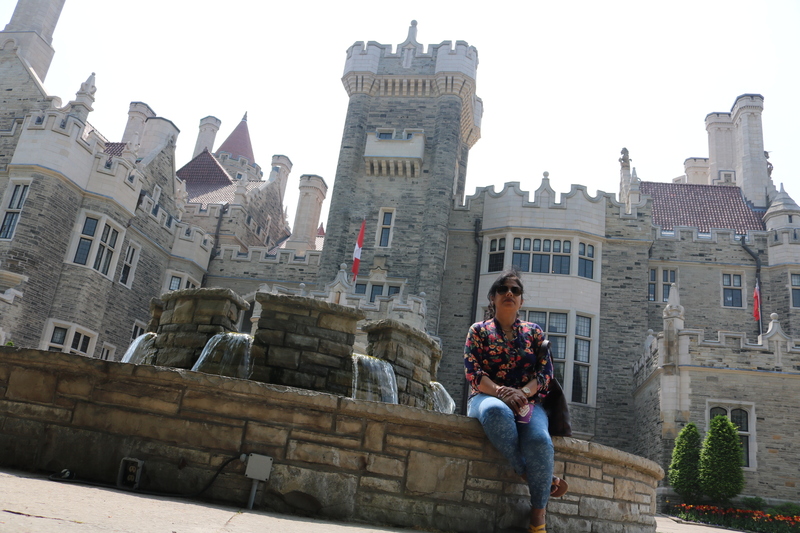 Casa Loma (Spanish for Hill House), was a dream house Major General Sir Henry Pellatt built. It still stands out as the biggest residential place ever built in Canada. It was General Pellat’s dream castle. Casa Loma took three years and $3.5 million to build (today’s worth about $75 million). 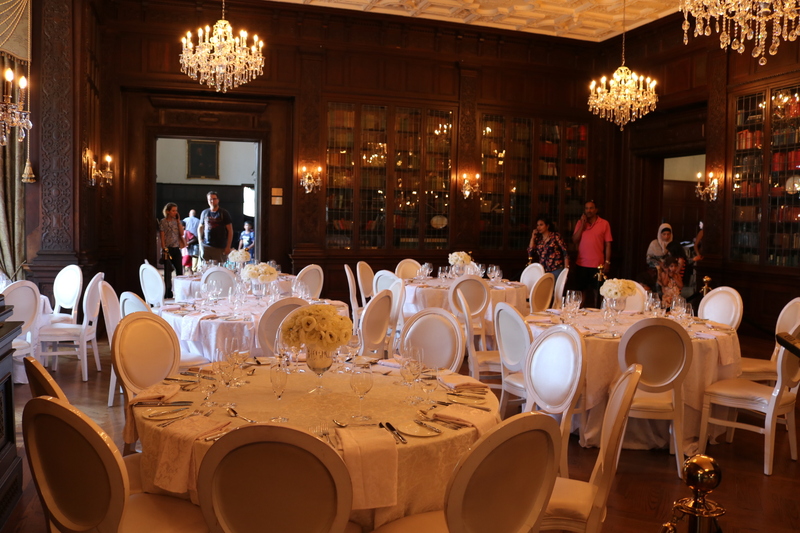 General Pellatt filled Casa Loma with artwork from Canada and around the world. With soaring towers, tunnels and secret passageways, it was a castle than a private residence. 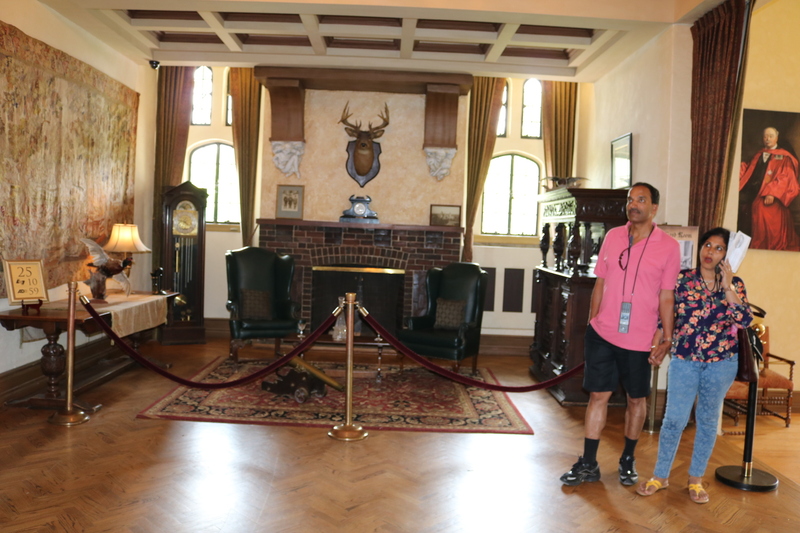 Casa Loma has 98 rooms, 30 bathrooms, three bowling alleys, an indoor swimming pool, and a rifle range. The original internal telephone system is preserved till date. Casa Loma had 50 telephones, one in each room, when the whole of Toronto had only 250. It served as a location for many movies such as X-Men, Strange Brew, Chicago, The Tuxedo, Love Guru and The Pacifier. The main floor opens with the Great Hall which leads into a library and the main dining room. In the main dining room, the Pellatts hosted many formal dinner parties. The 10,000-book library had the Pellatt family coat of arms carved into the ceiling, with herringbone oak floor pattern creating an optical illusion of different shades from each end of the room. Pellatts had a Serving Room which was also used as a breakfast room. 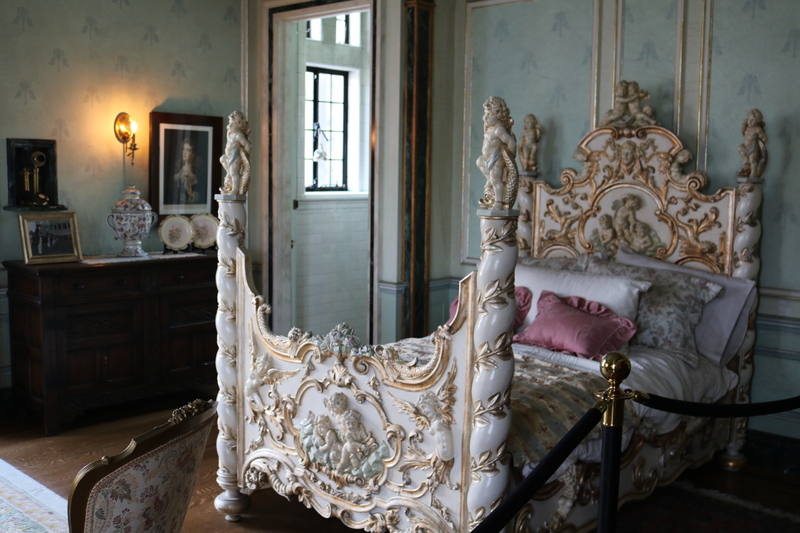 The room was inspired by Roman carvings. This room was the staging area into which the kitchen staff brought the cooked food for the waiters to carry to the dining room. General Pellat’s Study on the main floor had a marble fireplace with carvings of Hercules on the mantle. The walls had walnut panels which concealed a secret door on either side of the fireplace – the left one leading to the Pellatts’ bed rooms and the right one to the basement. The room also boasted of a desk that was the exact replica of Napoleon’s writing desk. This floor also had a Smoking Room for a game of chess or cards. 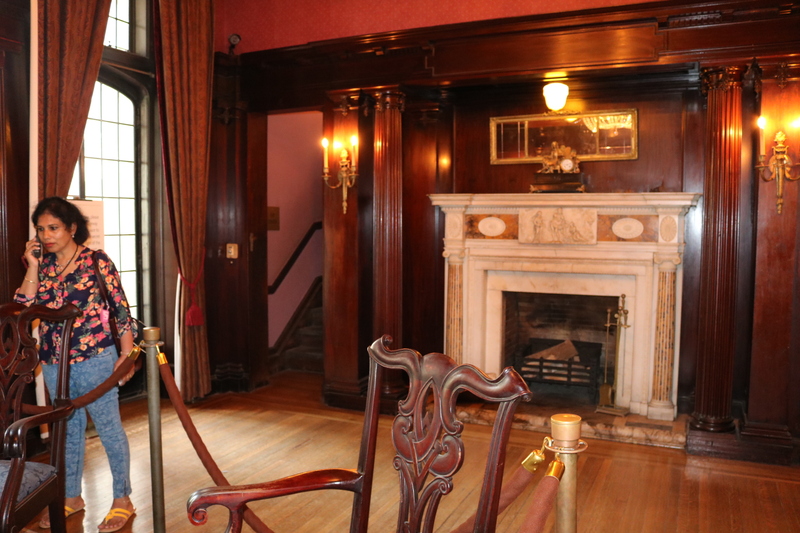 Adjacent to it was the Billiard Room where General Pellatt and EJ Lennox, the architect of Casa Loma and his neighbour, often played in the evenings. The second floor housed Genral Pellatt’s Suite, separate from Mary’s. The walls are of mahogany and walnut. The tiger skin on the floor was imported from India in 1920. The bathroom has a shower structured to completely surround the body with spray by using 6 taps that controlled 3 levels of pipes. Lady Pellatt’s suite adjacent to her husband’s suit had walls painted in her favourite colour: Wedgwood blue. Lady Pellatt’s bathroom was smaller than General Pellatt’s. It had a bidet, a rare feature in Canadian homes at the time. General Pellatt had five guest rooms, all suited for the royalty. He dreamt of having the Royal Family as guests at Casa Loma. This room was named Windsor Room after the Royal Family in England. It has a nineteenth century walnut bed with dolphins carved on to the posts representing Venus. This suite for guests is decorated in Chinoiserie style with a large red lacquered dresser imported from China. The walls are covered with Chinese inspired patterns of phoenixes and foo dogs. It also has a Chinese screen with carvings of flowers and trees and a mother-of-pearl peacock. The Third Floor housed the servants’ rooms and the Queen’s Own Rifles Museum. General Pellatt enlisted as a rifleman with The Queen’s Own Rifles on November 2, 1876. He rose through the ranks and eventually became the Commanding Officer. In 1905. In recognition of his services, he was appointed a Knight Bachelor by King Edward VII. In 1910, Pellatt took the entire 600-men regiment (including its horses) to England for military training at his expense, to mark the Regiment’s fiftieth anniversary from 13 August to 03 October 1910. General Pellatt later served as the regiment’s Honorary Colonel and was promoted to the rank of Major-General upon retirement. When Queen Victoria celebrated her Diamond Jubilee, General Pellatt went to England with some men and officers of the Queen’s Own Rifles to be part of the honour guard. In the basement was a Wine Cellar. 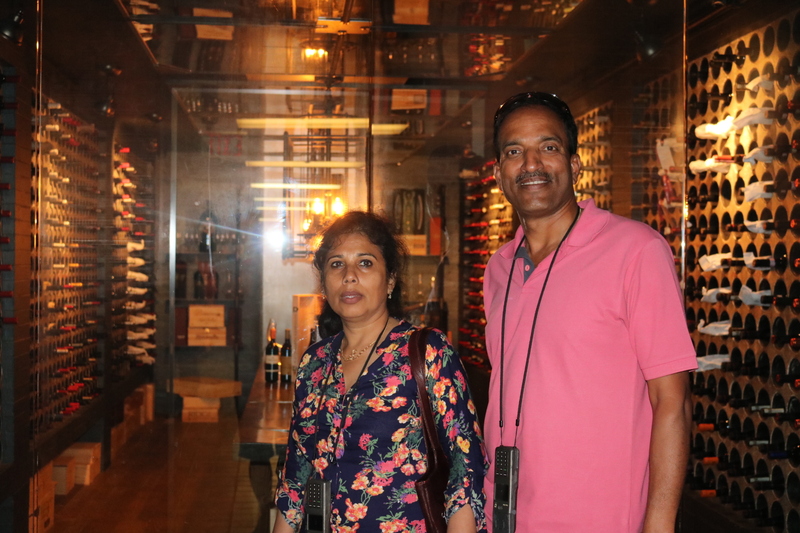 Ammonia and brine-filled pipes chilled the collection of nearly 1800 bottles of exotic wine and champagne. The Stables are connected to Casa Loma by an 800-ft tunnel. 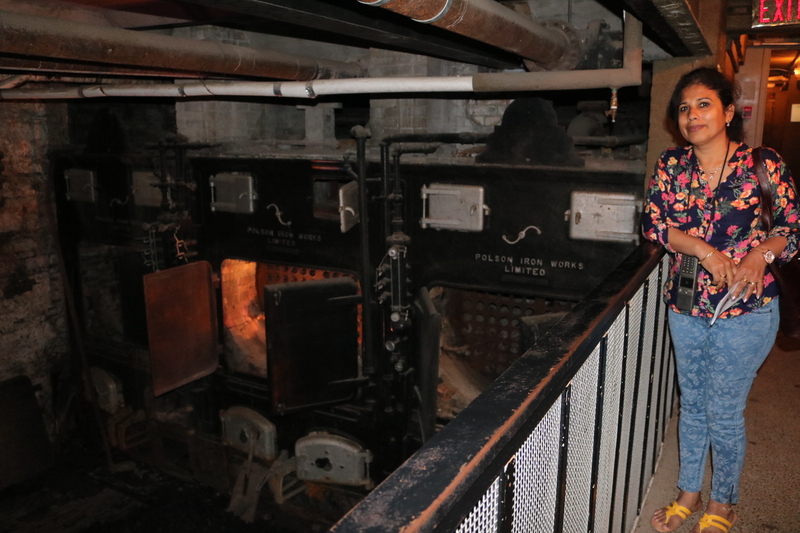 The tunnel also housed a coal based heating system to heat the entire building. Canadian army used the tunnel as a secret base to build a new SONAR system during World War II. The tunnel ended at the stables and garage. 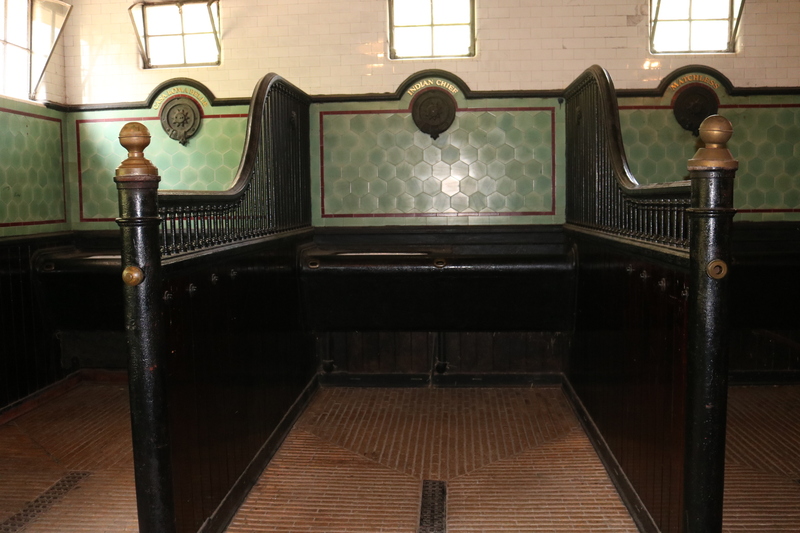 The stalls for the horses are constructed of mahogany and the floors covered with Spanish tiles so that the horses did not slip. Each horse’s name was inscribed on the wall in 18 Carat Gold. Major General Sir Henry Pellatt was born to British parents in Kingston, Ontario on January 6, 1859. General Pellatt left his studies when he was seventeen to pursue a career in commerce in the family business. By the age of 23, he became a full partner in his father’s stock brokerage firm Pellatt and Pellatt. He married Mary Dodgeson whom he met when he was twenty. He achieved fame in 1879 for beating the US amateur champion in one mile. As a partner in Pellatt and Pellatt, he founded the Toronto Electric Light Company in 1883. By the time he was 30, the Toronto Electric Light Company enjoyed a monopoly on street lighting of the city of Toronto. In 1892 his father retired, enabling General Pellatt to invest with more risk. By 1901, he was chairman of 21 companies with interests in mining, insurance, land and electricity. In 1902, he won the rights to build the first Canadian hydro-electric plant at Niagara Falls. 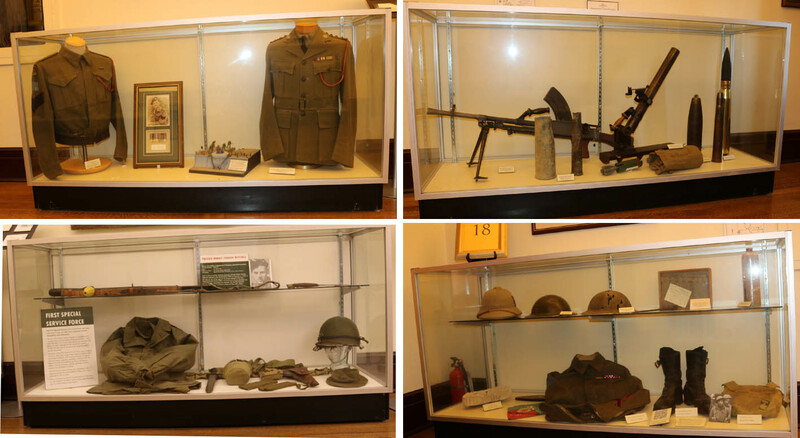 All these he achieved while serving with the Queen’s Own Rifles. After retirement, in 1911, he began building his dream castle – Casa Loma. Unfortunately, General Pellatt’s fortunes nosedived and he went into debt. The one sure source of income from the monopoly of electrical power vanished when the government took over the company without any compensation. He then invested into the airline business, to be taken over again by the government towards the war efforts for World War I. Post World War I economy of Canada slumped. So did General Pellatt’s fortunes. He owed the Home Bank of Canada $1.7 million and City of Toronto a heavy tax bill. He had no choice but to auction off his prized possessions for a fraction of their worth and to abandon his dream home – Casa Loma. After moving into many smaller homes, he last lived with his trusted chauffeur. 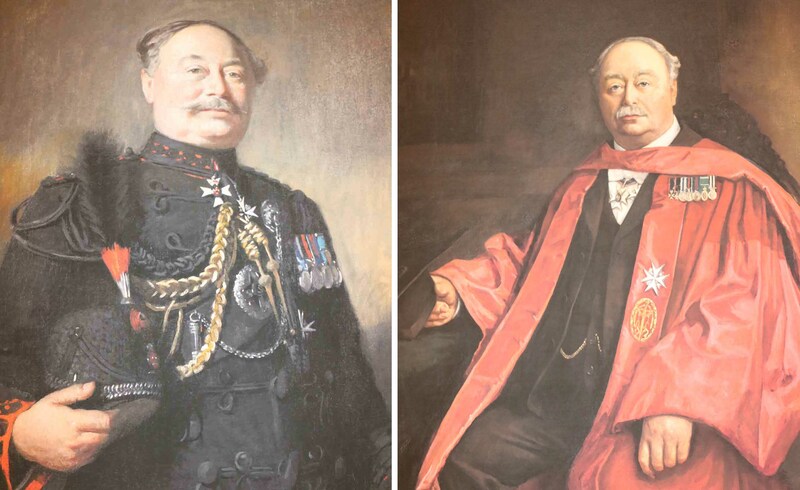 Though he lost a great fortune, General Pellatt never lost his spirit of philanthropy, a character trait for which he was honoured late in life. His service of fifty years with the Queen’s Own Rifles was celebrated on June 27, 1926 with a march past of 500 men complete with the fly-past of three military planes. A dinner was hosted at the Royal York Hotel, a reunion of the Queen’s Own Rifles, for his 80th birthday, including a telegram of congratulations from King George’s wife Queen Mary. General Pellat was moved to tears. He died two months later, in his chauffeur’s arms. Thousands lined Toronto streets to witness his funeral procession. He was buried with full military honours befitting a soldier who gave so much to his country. Visit to African Lion Safari follows. Very informative write-up Sir. Kudos. Detailed description about Casa Loma, the dream house of Maj Gen Sir Henry Pellatt is very interesting. I do hope to see the marvel sometime. AVM TD Joseph is well known to us as we were together in Delhi for quite sometime. His son Abhishek and my son Roshan were classmates at MSM Delhi.